Molds are fungi that are found both indoors and outdoors in almost every environment. The number of types of molds is estimated to be 300,000 or more, thriving in damp, humid conditions. In an outdoor environment, molds perform an important role in speeding up the decomposition process of organic materials. Certain molds are vital for the production of antibiotics, namely Penicillin, and for the ripening of some cheeses. Humans encounter molds every day, and in small amounts molds are harmless. It is when molds are present indoors in large quantities that their presence becomes an issue. Of the 300,000 types of molds, only five are the most commonly found in homes and include Cladosporium, Alternaria, Penicillium, Mucor, and Aspergillus. Large colonies of these molds require mold remediation Sacramento CA. Molds spread by spores that are released into the air and carried by air currents. If they should land on a surface capable of sustaining them, such as a moist surface like shower curtains or bathroom tiles, they grow rapidly. Other rooms in the house likely to host mold growth include kitchens, basements, laundry rooms, and crawl spaces. Unfortunately, after a water event like a flood, mold quickly starts to grow, and in these instances the services of a water damage restoration greater Rocklin CA contractor is necessary. Molds become problematic when the people living in the home are sensitive or allergic to them, requiring mold removal in Rocklin CA. Symptoms exhibited are the typical allergic reactions including runny or stuffed nose, eye irritation, wheezing or difficulty breathing, or skin rashes. Individuals with severe allergies may exhibit shortness of breath and fever. Those at higher risk include infants, the elderly, and those with compromised immune systems, asthmatics, and chronic lung diseases such as COPD. The correlation between chronic exposure to mold and respiratory tract symptoms such as coughing and wheezing is well-documented, as is asthma attacks in asthmatics. 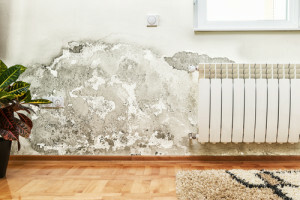 Homeowners can reduce mold growth by keeping the humidity levels below 50-percent and keeping bathrooms, laundry rooms, and kitchens well-ventilated, including the use of exhaust fans. During months of high humidity, running the air conditioning system preferably with a dehumidifier helps reduce humidity levels. Avoid carpeting bathrooms or basements and replace carpets or furniture previously exposed to flooding water or fire and smoke damage in Rocklin CA. It is recommended that homeowners not attempt to clean up molds areas of more than 100 square feet or a 10 x 10-foot area. Smaller areas of mold can be eradicated with over-the-counter products like soap and water or a bleach and water mixture. One can also use biocides to kill the mold, however, if not thoroughly removed, the components that trigger allergic reactions will be left behind. Mold found in a home’s heating and cooling systems or ductwork needs to have mold removal Sacramento CA performed by a licensed technician.